All geared up for Christmas yet? If you’ve been working on your body beautiful for all those Christmas parties, now is the time to really let your hair down and have some fun! 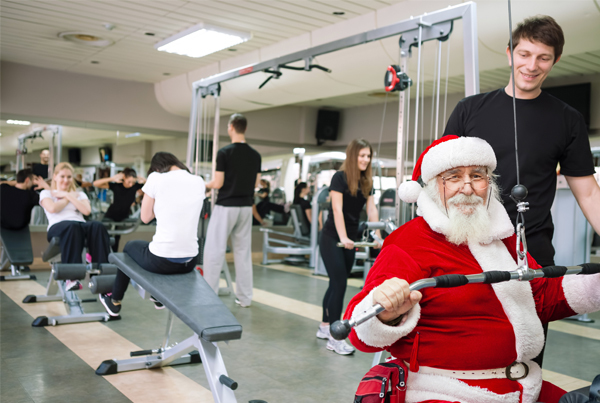 We’re feeling very festive here at Physfit and while we’re looking forward to some good times over the holidays, we’re still going to be around to help you stay in shape when you need us. Over the next few weeks we will only be completely closed on the Christmas and New Year holidays themselves, but our opening hours will change a bit. Merry Christmas From The Whole Team! Christmas has to be the best time of year to relax and enjoy yourself, while you catch up with friends and family and have some real fun. We would like to wish all of our members a very Merry Christmas from the whole team and we hope that the New Year is as special for you as the great one that we’ve just had! Thank you for all of your hard work and support in 2016 and we look forward to hearing those New Year’s resolutions when January rolls around again! Don’t Eat Too Many Mince Pies! And, of course, a Christmas message from us wouldn’t be right without a little warning to not let all that hard work go to waste over the festive period! While you’re having fun, do remember to watch those calories as you enjoy the delicious party food and drink! Need some motivation? We’re always here for a workout! And where you can, try to get outside and get some exercise over the Christmas period, because we promise it will be worth it in the long run when you can still fit into your gym gear in the New Year!